Note: This is NOT the actual Holy Forest Cafeteria, but just ONE of the POSSIBILITIES. And this is where the students and facility of Holy Forest eat their daily lunches-IF THEY HAD SUCH A ROOM TO DO THAT. (In the manga, it appears that there were cases where the lunch was BROUGHT TO THE CLASSROOM for the lunch period-thus the students spend a good portion of the day in the same room-different subjects-different teachers.) The food here is quite delicious. We offer a variety of choices for the students each and every single day. Of course the school store is always available as a last resort. The people in the cafeteria are those who have had some impact on the series. They are either situational or event-specific characters. Heck... some of you might disagree with how the characters are classified... but they have to go somewhere! The minor ones are gathered in the gymnasium. Section first created on: January 3, 2003. -"Punks of Class O, Musashino Public High School." One of the best friends of Eikichi Onizuka. They were both part of a notorious Shonan street gang before coming to Tokyo. They came to Tokyo under the promise that they'd both be great men. Now Ryuji operates a motorcycle stop in Kichijoji called "Garage R." Every so often Ryuji will do something for Onizuka, either through physical means or by offering verbal encouragement/advice. Has a girlfriend Nagisa Nagase. 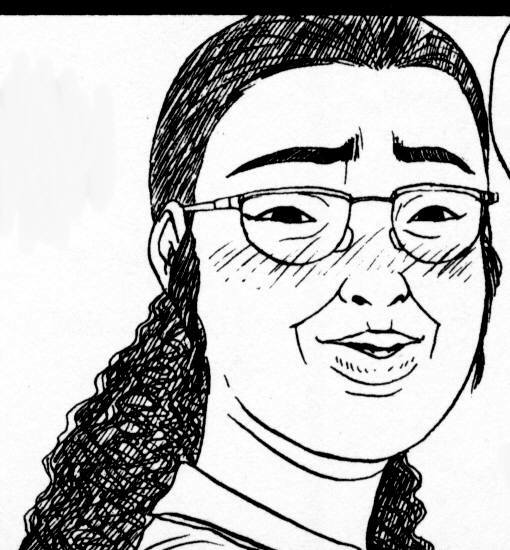 Before that, rumors was he was with someone else... a teacher named Ayumi. 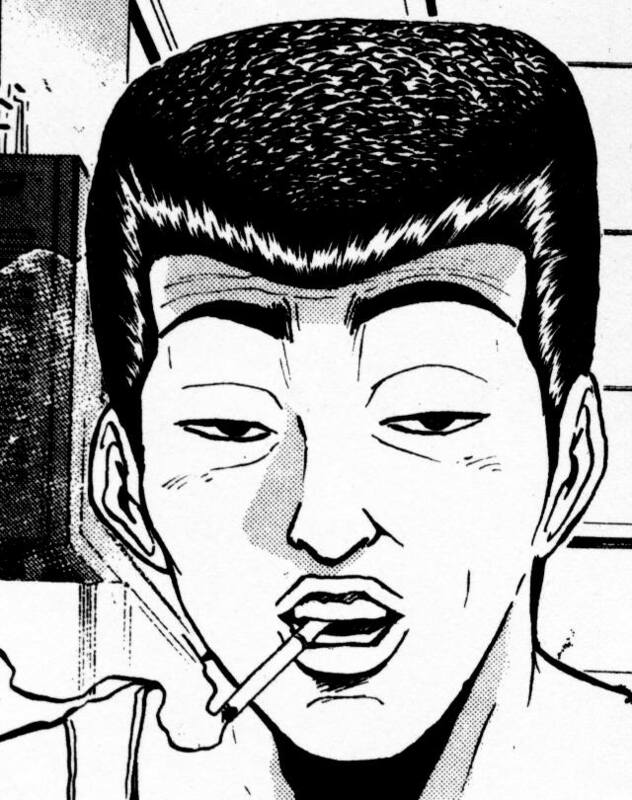 Another one of Onizuka's good friends, and was also a gang member back in the day. Now the man is a policeman... though not quite so outstanding and just as you might think. 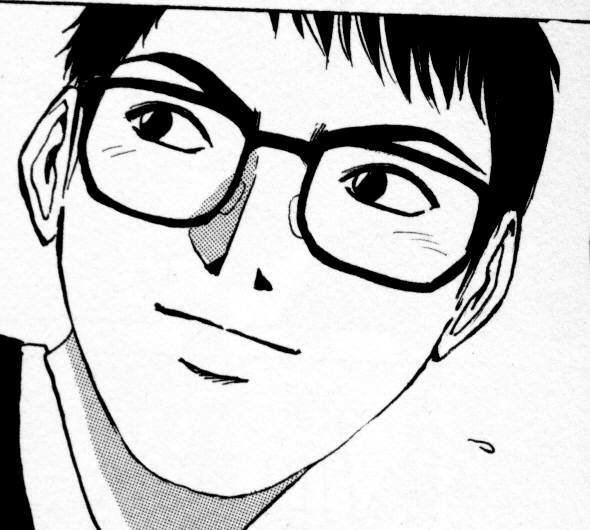 He's as much of a pervert as Onizuka, and is very corrupt. While trying to enforce the law, he's trying to go around it at the same time... often for personal pleasure or for monetary gain. Clickhere to go back to the 'front' (top) of this room (page). Only appearance: Anime>Volume 1-Lesson 1, Manga>from Volume 1-Lesson 2 up to Volume 2-Lesson 6. Class O over at Musashino Public High School is a troublesome bunch. These three individuals, along with Nanako, usually tries to blackmail the teachers... into getting cash. Unfortunately they picked the wrong teacher to deal with. 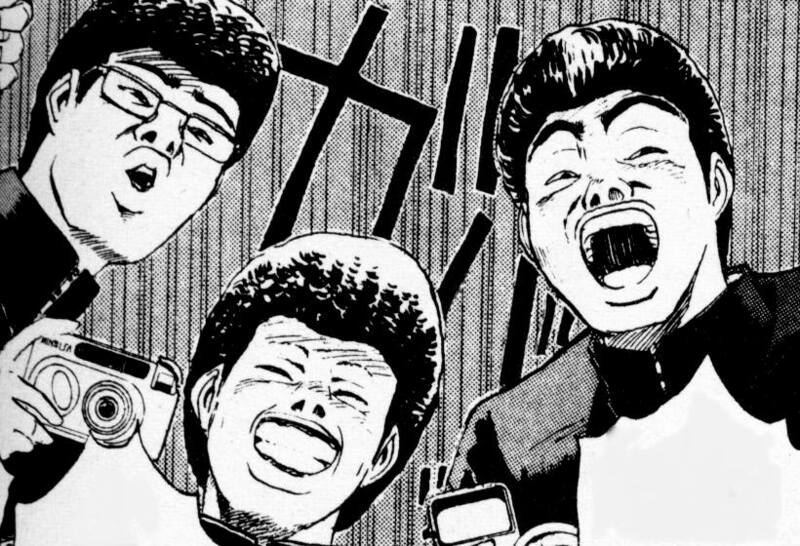 Onizuka taught these three a lesson (involving a park, motorcycle gang, and some water) after an attempted blackmail scheme. After words, Class O straightened up... literally shaping up over night (or close to it). Now you suppose that Mrs. Sakurai had found this out (when doing research on him to hire him), and that's the reason why Onizuka got stuck with Class 3-4 here at Holy Forest? Ah Onizuka's next big challenge at Musashino. She lured him into a trap in an attempt to try to get some money out of him (along with the 3 punks of Class O), but Onizuka didn't go down. At around the same time, she tried to reach out and get some help. With her family life deteriorating, she felt that Onizuka could fill that void. Ultimately, Onizuka did something to help her out, demonstrating (for the second time in the series) what he is capable of doing. Please note that Nanako's character was slightly altered for the live action drama version of G.T.O. Wife of Holy Forest Academy Vice Principal Hiroshi Uchiyamada. She seems to be closer to her daughter and the family dog more than to her own husband. Doesn't think much of him... other than bringing home the $$$. In fact... she might just be having an affair with the local meat man... Not much of her in the anime version though. Daughter of Holy Forest Academy Vice Principal Hiroshi Uchiyamada. She seems to be closer to her mother and the family dog more than to her own father. She tries to love him, but often only thinks less of him-because he's not around as much and the things he does-misunderstandings really. The family dog was called 'Dicaprio' (think Leonardo) but because he wasn't responding to it, she renamed him 'Eikichi,' much to the dismay of daddy-dearest. Even more so... the dog sort of looks like the great Onizuka. 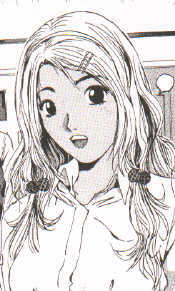 This picture below is her appearance as of Volume 18 of the manga. Changed her hair for the summer, along with getting a Kunio Murai-esque tan. First appearance: Anime>Volume 2-Lesson 7, Manga>Volume 3-Lesson 19. 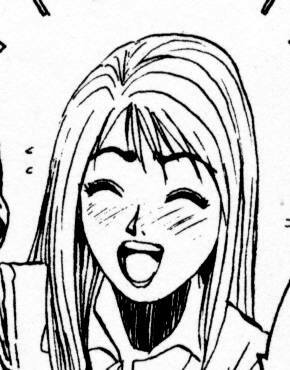 Age: According to the manga, she's 27, and had Kunio when she was about 15 or so. Mother of one Kunio Murai, and had him at a very young age. Julia didn't even know she was pregnant with him until six months had passed. Earned her parents wrath when she was determined to have him. After her parents cut all ties, she came to Tokyo to raise him, and to find work. Now she's a construction worker, who often times doesn't wear a bra, while wearing very tight, restricting clothing. Murai is very protective of his mother... determined to not let creepy guys hit on her and is willing to beat up on anyone who looks at her funny (i.e. his own friends Kusano and Fujiyoshi) and tries to make the moves on her(especially including one teacher Onizuka who really likes her). Some people may also think that Kunio has a 'Oedipus Complex,' where he has the hots for his own mother. It's all how you want to interpret, so I'm not saying that this is entirely right or entirely wrong. Onizuka and Julia first met under the not-so-good conditions. In the anime, they first met AFTER the Yoshikawa~Uehara~PTA incident, during the moment in the school year where teachers usually conducted home schooled visits. Onizuka decided to meet Mrs. Murai after getting some info from Kikuchi and Yoshikawa. In the manga, they first met BEFORE the Yoshikawa~Uehara~PTA incident. Kunio had done something bad to Onizuka at the arcade and the chase coincidentally led to Julia. In both versions, Onizuka got a kick to the crotch as a misunderstanding. And then they started to get friendly. Mrs. Murai's first name can vary. In Animerica Volume 11, No 2, it has her name listed as 'Juria,' and several fansites list it as 'Juria' as well. I believe the credits of the DVDs (US release), along with the manga (US release) has it as 'Julia.' Then again, 'Juria' sounds like 'Julia' in a sense... Keep in mind that there is no 'L' in the Japanese language... which is why sometimes 'English' in Japan is referred to as 'Engrish,' as this accounts for 'Juria' in the Japanese version. First appearance: Anime>Volume 2-Lesson 5, Manga>Volume 3-Lesson 22. Makes a cameo appearance in Volume 22, Lesson 176 of the manga (looking somewhat different by the way) when the story shifts to Anko & Yoshikawa for the second third of the volume. Only appearance: Anime>Volume 3-Lesson 12 up to Lesson Volume 5-Lesson 15, Manga>Volume 5-Lesson 40 up to Volume 6-Lesson 50. Doesn't go to Holy Forest Academy, but one of the few links she has with it is one Suguru Teshigawara. Another one of those spoiled, rich kids with some class and priviledge who tries to take advantage of everything that's there. Doesn't very much of men... and she had Teshigawara as her tutor and slave (as unofficial 'payment' for the class, status, things that the Ohtas did for him that he wanted). Sick little girl (the foot licking thing). Tried making Onizuka her slave... but that didn't work. 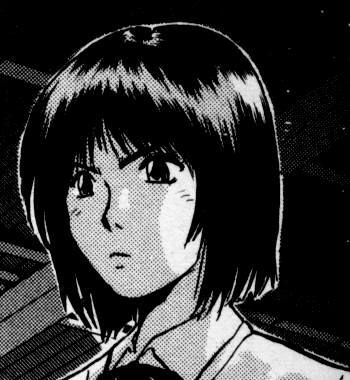 Something happens where she gets to see just how Onizuka can truly act under an intense and dangerous situation. Education: Meiji University. Was the President of the Idol Fan Club there. Tomoko's manager. After the Miss Kichijoji (Miss Inogashira in the ANIME) competition, Tomoko became really famous. He became her manager and is directing her as best as he could. His first run-in with Onizuka was unfortunate. The van Ichiro was driving hit Onizuka, and the poorest thing that Ichiro could have done IS NOT check on how Onizuka was doing. Accident or not, there would have been a time to determine who was at fault later... a man's life could have been on the line (although this is Onizuka we're talking about... a man who survived 3 leaps off roofs (2 onto Crestas, and 1 onto some boxes) amongst other things-so some collision wasn't going to do him in that easily). He wound up 'settling' with Onizuka in a unique way. Unfortunately, this wasn't the last time Ichiro was going to be around Onizuka (anime version wise). Onizuka does contribute and 'teach him' a few things... Even Ichiro plays a role in the final episode of the GTO Anime. In the manga, there will be specific parts of it reserved in seeing Tomoko becoming a superstar (the ends of Volumes 12, 13, and 14.) In the anime, it's slightly different (as it involves Onizuka and co. along with a different 'set' of events) in Volumes 6 and 7 (Lessons 27 and 28). We get to see a bit more Ichiro's character and just how Tomoko really is in showbiz in either case! -Member of the Holy Forest's Volleyball Team. 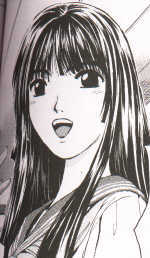 Manga specific character, replaced by Akane Fujita in the anime. She seems to have taken a shining to Mr. Onizuka after the Togaku test/saving Hidemi Ohta incident. This unfortunately pisses off one Kunio Murai... who may have a crush on her. Also one of Murai's suspects when he received that letter from "F." Fukada and Murai first met one rainy day (aw)... he was waiting for a bus... standing under only his bookbag... and she was the one kind enough to share her umbrella. -Met Kunio Murai (back when he had black shaved hair) when he came to her defense when some bullies were picking on her due to her size-about 2 years ago from the start of the anime/manga. -Player on Holy Forest's basketball team, and a really good player. Has been scouted and been given offers to play elsewhere! -Member of a manga club... I believe where you create your own. There is nothing wrong with being an aspring manga writer/artist. -About or greater than 6' 3". Anime version synopsis: A really tall lady who has a crush on Murai. She was the one who wrote the letter to him, saying that it was a letter from 'F in class 2.' Unfortunately, she should have been more obvious and truthful... because this sends Murai around trying to figure out who... with not so nice results. (Murai, Fujiyoshi, and Kusano were thinking more of LAST(family) names that BEGIN with F in the beginning, not FIRST names). 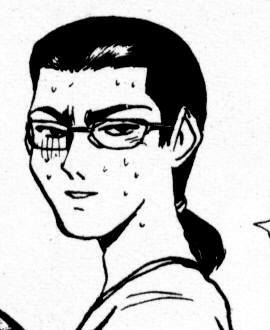 Manga version synopsis: A really tall lady who has a crush on Murai. Everything that happened in the anime (for the most part) occured in the manga here as well, but when Murai confessed to liking 'Fukada,' Kujirakawa sets him with her... but not the one Murai thinks... Also is a bit sensitive of people making fun of her height. Click hereto go back to the 'front' (top) of this room (page). Anime version: Only appeared during the Okinawa trip to get advice from friend Kujirakawa and put thoughts into Uehara's head. Lives with her father out in Hokuba, where she helps him run a nice little bed and breakfast. 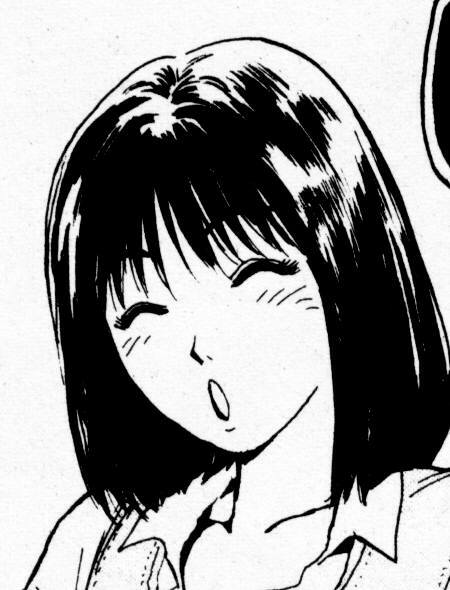 Both the anime (Volume 5) and the manga (Volume 9) have an event where the girls (in Miss Fuyutsuki's class, Class 3-2) get jealous because all the guys seem to like Miss Fuyutsuki more than they do. Several little attempts made by the girls to scare Miss Fuyutsuki forces the teacher to evaluate things and dwell on the past. In the anime, this sequence is longer and thus enables us to learn more about Miss Fuyutsuki. Anyway... she use to be so close to Miss Fuyutsuki, but her hatred of teachers changed it. It took some talking (especially from Onizuka) to get some things straight. All of this started because of the actions of one Miss Sagara. The friend and accomplice of one Mayu Wakui. Acts as his assistant... and gets jealous if any other girl is hanging around Wakui. She has a tattoo of a butterfly on her cleavage... and when she squeezes her bust in and out, it looks like the butterfly is flapping its wings. This is rather interesting... though one could only imagine what it would like like as she grows older...not a pretty sight I'm sure. Is possibly older than Mayu Wakui... it's safe to assume this because she doesn't go to school-at least not at Holy Forest, and that a mature woman/girl could not only get a tattoo, but also have such large breasts. Only appearance: Anime ONLY Volume 10-Lessons 42 & 43. Only appearance: Anime ONLY Volume 10-Lesson 42 & 43. 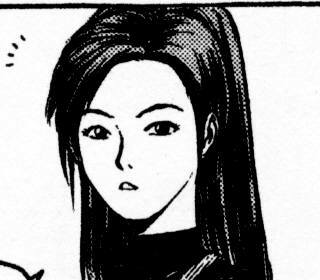 -This is Urumi Kanzaki's mother. She knows how to make quite a bundle of money... by playing the stock markets to her advantage. Uses a vast pool of equipment and information to do all of this (making Martha Stewart look like an amateur). Not much of a mother... is more concerned about making money. Urumi's sole purpose in life (according to her somewhat cold and uncaring mom) was to be a source of money, money, and money for her mother. In fact... the big 'secret' that was mentioned before was in part due to how Urumi's mom chose to have her daughter. Like in Urumi's profile, I will not dive into the exact secret. At first, doesn't think much of Onizuka... sees him as an 'obstacle' to her 'daughter's success.' 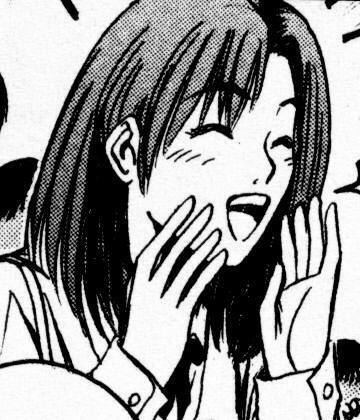 Like with some of the other parents in the series, Ms. Kanzaki learns a few things from Onizuka (of course not after the usual dramatic, or over the top antics/situations)... and is much better off. 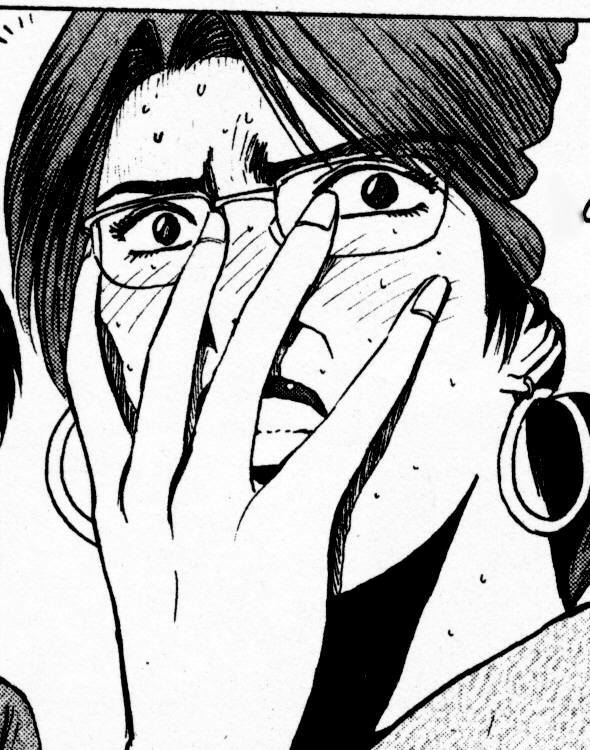 >>Fansite owner is groaning at Tokyopop's latest mistake in Great Teacher Onizuka... will they ever learn (and stop doing this)? -In the manga, Miyabi's mother has blonde/light colored hair. As you can see, it's dark in the anime. -Miyabi's father's first name is Kotaro, while her mother's first name is Masayo. This was revealed during Volume 23, Lesson 183 of the manga. No first names were ever given during the course of the anime. I should have mentioned Miyabi's parents before, but I never got around to it. The Aizawa home environment is not as what it should be. They try to hide things, and make it look like everything is ok, but in reality it isn't. Of course Miyabi is not clueless... she knows what is going on. With what had happened at school (to cause her to turn evil and attack the teachers), and her home live in ruin, you wonder why Miyabi is so angry and cranky. If Ms. Aiwaza is aware of what her husband does, then why does she put up with it? Why does Mr. Aizawa do the things that he does? Serious family problems here... Oh but then again, the mother is no saint either. -It was mentioned that Mr. Aizawa is in the banking industry. In the anime version, it was mentioned that the Aizawa family has problems, but it 'tension' was never resolved (or developed to the point where it was important or could be a plot device) by the end. In the manga, we as the readers get to see the problems in more detail/develop more, and eventually reach some sort of 'conclusion' to the problems (Volume 23). Plus Mr. Aizawa is a bit more sleazy in this version. -Younger sister of one Azusa Fuyutsuki. -One of her most potent weapons: her school uniform. She tries to get what she wants using it... and that's answers to her questions. -Judo White Belt. Do not mess with her. Are upperclassmen-former after certain events-at Holy Forest Academy. These male students have little to no respect for women... as they think they can use some of them to fulfill their sickest desires. They try to mess with one Ai Tokiwa, but with poor results. They later come back seeking revenge... but they mess with one Eikichi Onizuka, with even poorer (but funnier) results. -... Because the Angels have started their attempts to tear Class 3-4 apart. Their message about Aizawa mentions an incident that happened while she was in junior high. Start putting the pieces together and you will see how everything got started... as he is one of the key elements to how everything got started in the first place! -First "appeared" as "Snackzilla" (Kikuchi's online chat friend; just after the test results event) in Manga Volume 7, Lesson 52. -Finally makes an actual appearance (where we can see what he looks like), starting in Volume 23, Lesson 104. -With Kikuchi, was the "School Defense Force" when they were both younger. What they did wasn't mentioned, but it must have been really interesting. Was a member of Holy Forest's Class 4, BEFORE the "classroom terrorism" started. Note the key word is "was" because something happened years ago... that led to his exit from Holy Forest Academy. It's also important that he's one of the key elements to how everything got started in the first place. Did a lot of chatting with Kikuchi, under the alias of "Sandwhale," for certain reasons. Go over to the Computer Lab for some more information. 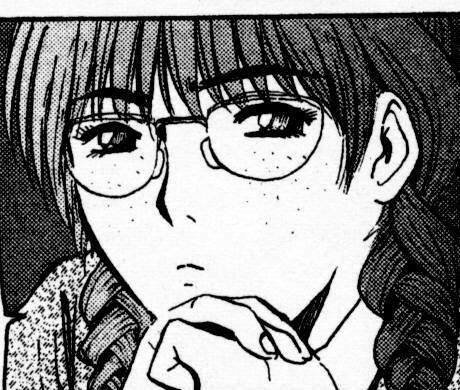 Takumi gets mentioned more there during my "analysis" of Kikuchi's importance in GTO. As Takumi is as dangerous and capable as Kikuchi is. BACK TO THE FRONT OF THIS PAGE!! !